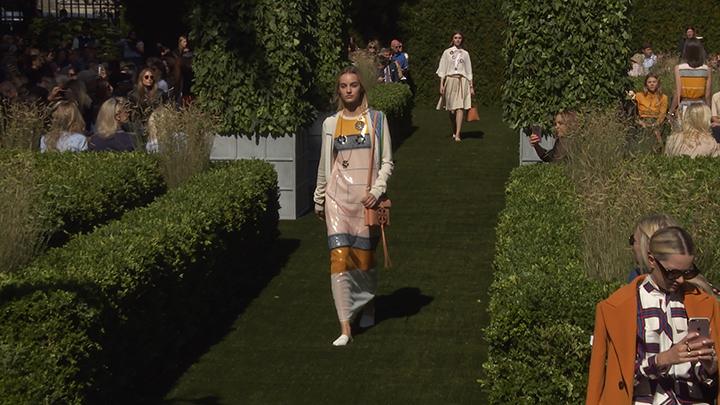 Tory Burch flaunted a flawless Spring/Summer 2018 line in the garden of the Cooper Hewitt at the Smithsonian Design Museum this NYFW. With not a cloud in sight, Burch’s vibrant colours and varying contrasting prints was hailed as successful as the gorgeous weather that day. Drawing inspiration from influential interior designer, David Hicks, as her muse this season, her show was a wondrous phantasmagoria of technicolor and bold prints. On one side, there was an easygoing, boho-look strutting down the runway, and on the other, a refined chic style that had every show attendee Kelly-green with envy. 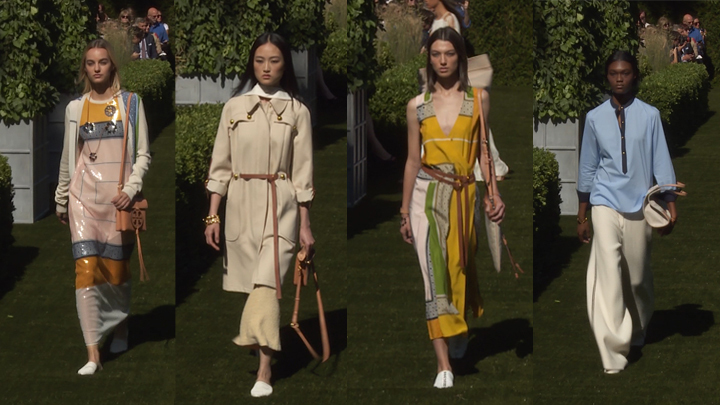 However, smack in the middle, Burch surprised with outfits paired with contrasting geometric prints. 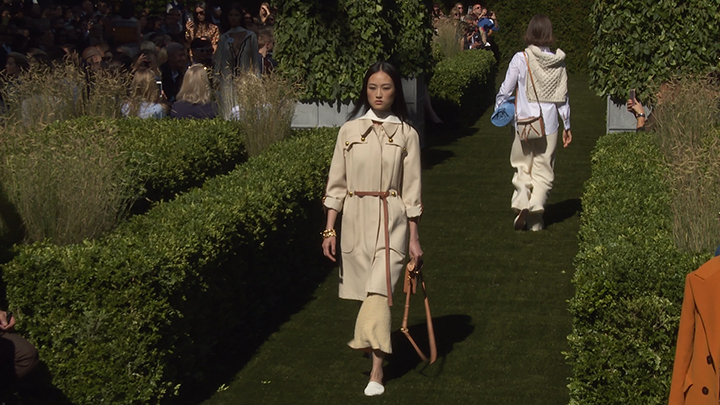 The line stayed true to Tory Burch’s signature bohemian-meets-MOD-girl vibe which meticulously matched with Hick’s bold, graphic prints he often used for his interior design of flooring, wall coverings and upholstery. 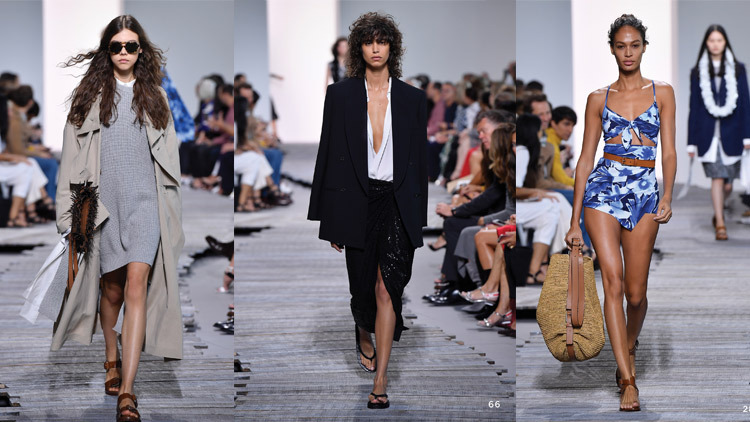 From low V-neck dresses in vibrant colours, to florals, to nautical stripes, to chilled boho-prints, Tory Burch did not hold back in providing a variety of styles and shapes this season. It’s easy to say that her SS2018 line caters to coast-to-coast. However, she laughingly admitted after the show that Ashley Hicks, whom gave Burch and her team access to his father’s library, told her that his father would have hated it.